Catbirds get their name from the cat-like meow that is one of the many sounds they make. They're often secretive and like to sing from the middle of dense shrubbery, so it can be easier to hear them than to see them. Both males and females are slate gray with a black cap and black tail. Our days are at their longest now, and dawn comes early with its chorus of birdsong. If you're up with the sun, you'll get to enjoy the earliest singers. The gray catbird (Dumetella carolinensis) sings very early – as robins do – and you'll also hear it throughout the day. You're much more likely to hear it than to see it. The catbird's habit of hiding and singing shows why "birding by ear" can be a good way to recognize local wildlife. Look – or rather, listen – for catbirds around Westborough in areas with dense shrubbery or brush. These places include well planted backyards, woodland edges or streams, or old fields that nature is reclaiming with saplings and shrubs. Catbirds eat insects in summer and fruit year-round, including blueberries and raspberries. You'll often find catbirds down among the bushes, rather than up in the treetops. What's all this spring and summer birdsong about, anyway? Mostly it's the male birds of many kinds that sing in our area, and they do so thanks to hormones. As the daylight lengthens in late winter and spring, their testosterone levels rise, preparing them for breeding. The song centers in their brains get larger, and they begin to sing. The song itself is a way of communicating – typically to claim a territory and to attract a mate. Catbird songs are long, varied, and musical but also filled with odd and harsh sounds that are distinctly not musical by human standards. You'll hear gurgles, squeaks, and chirps. And you know you're listening to a catbird when the flowing jumble of sound includes a surprising "meow" like the cry of a cat. Catbirds are mimics, like their relatives in our area, the northern mockingbird (Mimus polyglottos) and brown thrasher (Toxostoma rufum). They imitate other birds' songs and often include parts of them in their own songs. Catbirds have a good memory and even use pieces of songs that they could only have learned from birds on their wintering grounds, as far away as Central America for some catbirds. What about the meow? Do catbirds imitate our housecats? No, as it turns out. The meow is part of their own song. Catbirds also use their meow by itself for other purposes. For instance, competing male catbirds may use it with each other. Male and female catbirds may use it when a predator - or a human - approaches their nest or young. Catbird songs can last many minutes and include more than a hundred different sounds. You can tell a catbird's song from a mockingbird's song by the number of repetitions in a row. A mockingbird will repeat a phrase or sound three times in a row or more, but a catbird will use each phrase once. And of course, catbirds usually throw in a meow. 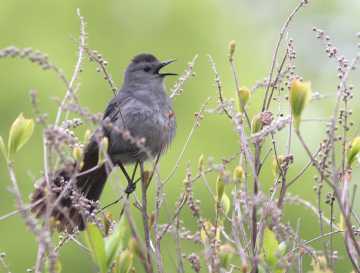 How do catbirds produce their remarkable song? Like other songbirds, they have a voicebox that's quite different from ours. It's located deep in the bird's chest, and it has two separate branches that the bird controls independently. Catbirds are among the 20 percent of songbirds that control the two branches of their voicebox so well that they can make two different sounds at the same time. The left branch of the voicebox makes lower notes, and the right branch makes higher notes. A catbird can actually sing a duet with itself, using two voices at the same time. Or just think of a piano player using two hands to play one piece. The catbird that you hear today in Westborough has probably already raised one brood of chicks and may be getting ready to start another. If you had a catbird nest in your yard, you'll find that the birds will build a new one somewhere else. Catbirds usually arrive here by early May after wintering farther south. The males arrive first and establish territories – by singing loudly from high perches – and the females arrive a week later. Once a male and a female pair up, they may work together on a couple of nests, but eventually the female builds the final nest and lays 3-4 turquoise green eggs. When the female begins sitting on the eggs, the male stops singing and becomes more secretive, staying nearby. Sometimes, after a short spell off the nest, a catbird may find a strange egg in it. Brown-headed cowbirds (Molothrus ater) – which you can sometimes spot in trees at the Mass Fish and Wildlife fields – are famous for laying eggs in other birds' nests, and they often try this trick with catbird nests. But unlike many other birds, a catbird's memory is keen enough that it usually recognizes an egg that doesn't belong and pushes it out. Both parents feed the chicks once they hatch. After the young leave the nest, they stick around for a couple of weeks while the parents continue to feed them. Toward the end of this time, the female starts a second nest and the male takes over the feeding duties. The male may start to sing again. In September our local catbirds begin moving south, but we'll probably see others passing through from places farther north. Some catbirds spend the winter in coastal areas and parts of Cape Cod, but generally they go much farther south, to the southern U.S., the Caribbean, and Central America. Many of us have probably heard the old phrase, "in the catbird seat", used to describe someone who's in an advantageous position where good things come easily. The expression was popularized by baseball announcer Red Barber (1908-1992) and by cartoonist and writer James Thurber (1894-1961), who published a story called "The Catbird Seat." But what do catbirds have to do with it? It's hard to say exactly, but the expression apparently comes from South, where catbirds live year-round in some parts. It may refer to the good places where catbirds like to be when they sing – either well concealed and safe inside a bush, or high on a perch overlooking their territory.